These days, all candidates try to position themselves as “political outsiders,” but in 1992, there actually was one. In that year, self-financed billionaire Ross Perot, an independent presidential candidate, won 19% of the electoral vote, the most any such candidate received since Theodore Roosevelt in 1912. Earlier in the summer, he was actually leading both Clinton and Bush in the polls, and people were talking about “the end of party politics.” A series of blunders including an extremely misguided choice for his vice-president was his undoing. And although he lost the election to President Bill Clinton (and trailed incumbent George H.W. Bush in the final tally), Perot’s startling run exposed a very deep dissatisfaction with business-as-usual politics in the American people. Within six months of his defeat, two studio movies were released that expressed this burgeoning mistrust of our political system to wildly different results: “Dave” and “The Distinguished Gentleman.” We all know that these movies weren’t put together to capitalize on Perot’s success; it takes at least a year or two for a movie to be produced. We can, however, look at these dual developments in film and politics to gain a deeper understanding of what Americans were feeling at this time and place. First, we must establish exactly what Perot represented. When he entered the campaign with his appearance on Larry King Live in February of 1992, he didn’t have much of a platform. He talked mostly about two things: the out-of-control spending that led to our crippling deficit and the fact that he was not a politician and was therefore more qualified to solve the problem. His campaign was buoyed by subsequent events. The first was the check-bouncing scandal which broke just weeks after his entrance into the race. The scandal was big news: twenty-two Members of Congress were singled out by the House Ethics Committee for leaving their checking accounts overdrawn for at least eight months. It was something that average American, who were suffering through a recession, could relate to. Further, it reinforced the idea that Washington was broken, and many Americans saw the scandal as an indication that maybe another career politician wasn’t the way to fix it. 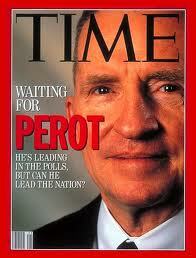 The long, drawn-out primaries also helped Perot. Both Bush and Clinton faced serious challenges in their campaigns. Clinton and Jerry Brown suffered through an especially brutal primary, in which Clinton’s extramarital affairs were big news, and Bush had to fend off libertarian Pat Buchanan, who garnered an unusual amount of support for a primary challenger to a sitting president. By the end of these two campaigns, people were sick of the negativity. This city has become a town filled with sound bites, shell games, handlers, media stuntmen who posture, create images, talk, shoot off Roman candles, but don’t ever accomplish anything. We need deeds, not words, in this city. In 1992, these were strong words, and people liked what they heard. To reinforce his outsider narrative, Perot carefully staked out a non-partisan platform. He was pro-choice. He supported expanding the war on drugs. He wanted to balance the federal budget. Supported gun control. In the end, he positioned himself perfectly: exit polls in November showed that 38% of his support came from Republicans and 38% came from Democrats. The other 24% said that if Perot were not on the ballot, they would not have voted at all. “The Distinguished Gentleman” and “Dave” were not designed with Perot in mind, but it is easy to see similarities in the way they portray the government. Each tells the story of an everyman who comes to Washington for reasons that have nothing to do with public service. In “Dave,” a presidential look-alike gets hired to play president for real when the real president falls into a coma. “The Distinguished Gentleman” is about a con man who bluffs his way into Congress after realizing he can make the most money there. As outsiders, both see first-hand the problems in Washington and set about fixing them. But although their plots are similar, we are really looking at two very different movies. First of all, “Dave” was a financial success, making more than $65 million in domestic box-office receipts, while “The Distinguished Gentleman” made only $47 million. $47 million is nothing to sneeze at (especially in 1992 dollars), but when you have the star of “Coming to America” and “Beverly Hills Cop” in your movie, you expect more. There is no question that “Dave” resonated more deeply with audiences, and the reason is clear: “The Distinguished Gentleman” explored truths that Americans may not have been ready to hear. “Dave,” much like Perot’s candidacy, told a simple narrative about what was wrong with Washington, never addressed specifically the corruption at its core, and offered an even simpler solution. They sold us narratives to make us feel better, but they never got us any closer to a solution. The titular character in “Dave” is Dave Kovic, a likeable fellow who is initially hired just to stand-in for the president at a public event so the real president can have a late-night rendezvous with his girlfriend. 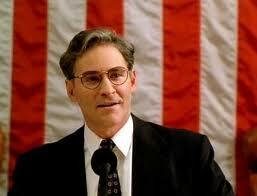 In the opening scenes, we see Dave as a liberal fantasy of what a president could be. While the real president is finding ways to kill a bill that will provide funding for homeless shelters, Dave is running a temp agency on a “barter system.” When the president falls into a coma, his evil advisor, Bob Alexander, hatches a plan: he will convince Dave to take the president’s place, dig up dirt on the VP, get him impeached, get Dave to appoint him to the VP slot, then get rid of Dave and ascend to the presidency when the real president succumbs to his coma. Frank Langella plays Alexander as a typical movie heavy: all threatening glares and intimidation. His scheme is a pure power grab, and the result is an antiquated, Nixonian portrayal of individual corruption. At no point are we to believe that maybe the system is partially to blame. As easily as 19% of the country could believe that one man, Perot, could fix the problems in Washington, in the world of “Dave,” one man was the problem. “The Distinguished Gentleman” takes a much deeper and darker view of corruption in government. Jeff Johnson (Eddie Murphy) bears the same name as a recently deceased Congressman. (Interesting side note here: in the film, the late Jeff Johnson suffered a heart attack while sleeping with his assistant, much like President Bill Mitchell in “Dave.” At this point, it seems that promiscuous behavior by a politician was a short-hand for corruption. This is probably why the Republicans made such a big deal out of President Clinton’s sexual indiscretion. They saw it as a way to quickly and simply discredit the entire Democratic Party as morally bankrupt). The specifics of Johnson’s election, after a low-profile campaign based purely on name recognition, tells us that we are in pretty cynical territory. After all, an entire Congressional district failed to notice that their Congressman was dead or that this Jeff Johnson had a minor third-party (the Silver Foxes!) next to his name on the ballot. But this cynicism is just the tip of the iceberg. They make a pretty convincing case, and it’s hard to imagine that this is not how it plays out in real life. The film’s screenwriter, Marty Kaplan, has a resume that suggests he knows what these conversations sound like. Kaplan was a speechwriter in the Carter administration and was deputy campaign manager of Vice-President Walter Mondale’s 1984 presidential run. Kaplan was writing about a very real systemic problem in American government. But, according to the grosses, the American people were not ready to hear it yet. They much preferred the portrayal of corruption in “Dave” – one bad apple with a big ego and lust for power. But as we now know, that’s just not the whole story. “The Distinguished Gentleman” ends on a happy note, as Johnson exposes the corruption in his committee. No real thought is given to his future: the final line, in which he states he is going to run for president, is a throw-away – he even breaks the fourth wall and grins at the camera. “Dave,” on the other hand, ends on a fantasy so naïve and ridiculous that it immediately wipes out any serious message that could have been hidden in the film. Dave not only manages to expose the corruption of Bob Alexander and escape from the White House without anyone catching on, but he gets the girl – in this case, the First Lady – and gets a massive jobs bill passed (you know this is a liberal fantasy because it is compared to the New Deal). But perhaps most amazing is that Dave’s faith in government is actually confirmed by his experience. At the end of the film, after having spent weeks in the White House, privy to cabinet meetings and the most backroom of negotiations, we see Dave in his new campaign office – he has decided to run for councilman in his hometown. The story of “Dave” and “The Distinguished Gentleman” tells us that by 1992 the disillusionment from the Nixon-era corruption scandals had faded enough for us to laugh at them. But it also tells us that we had not yet learned. It was not until the 2008 Democratic presidential primary that “lobbyist” truly became a dirty word. Even then, it was mostly just a campaign buzzword. And in 2008, there was no Ross Perot around to cut through the bologna. Judging from Eddie Murphy’s last line in “The Distinguished Gentleman,” the producers were planning on a sequel. Maybe that’s just what we need. Fascinating how those two movies rose up around the same time as Perot’s message hooked us. So right about the audience being not quite ready for The Distinguished Gentleman. In Dave, I think we identified with him, the everyman who can get in there and fix everything, with his own accountant no less. But until Eddie Murphy does his about face toward the end of the movie, although funny, he’s not the guy we want to identify with. We want distance between ourselves and the con man. Part of the reason why Dave worked better is while it’s obviously grounded in politics, it’s not a “political film” in the sense that its main purpose is to prove a point or otherwise have some social relevance. It’s a charming movie about a likeable guy who accidentally becomes the most powerful man in the world, and must then struggle through all the stuff that comes along with it. Distinguished Gentleman was edgier and more direct, plus it starred Eddie Murphy at a time when people were starting to get tired of Eddie Murphy movies. Thanks for your comment. I definitely agree. “Dave” has been described as Capra-esque, and I think that’s right on the money. It’s a fantasy about what it would be like to be president, and they never explore the real dark side of that. It’s all very general, and, as you say, non-political.